Erick made a video compilation of evidence of Numerous Eye Witnesses to Multiple Shooters in Florida. It has since been removed. Here is his transcript which contains evidence that Sheriff Israel’s men may actually be the shooters. 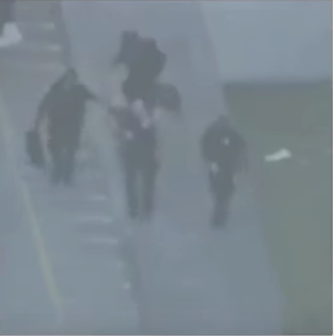 The bag was apparently so heavy it took two officers to carry it. A third officer can be seen lowering the tailgate on what looks like a White Late Model Ford 4 Door (crew cab) pickup truck with a 6 foot bed; again, apparently because the other two officers (carrying the bag) could not just simply lift the heavy bag over the side and throw it in the back bed of the truck. Note, This is evidence of officers tampering with a crime scene and evidence at one of the biggest crimes of the decade, with national / international significance. These officers faces can be clearly seen on the video.